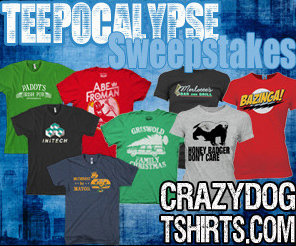 Thrifty and Frugal Living: Teepocalypse: Enter to Win 1 of 8 Huge Prizes from CrazyDog T-shirts! Teepocalypse: Enter to Win 1 of 8 Huge Prizes from CrazyDog T-shirts! Thanks for sharing! I am a big fan of CrazyDog!